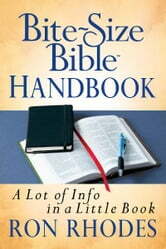 Bible scholar, popular author, and creator of the Reasoning from the Scriptures series (more than 180,000) Ron Rhodes presents the Bite-Size Bible series...concise and easy-to-understand tools for Christians and other seekers who want the essential information about God and His Word without technical language. 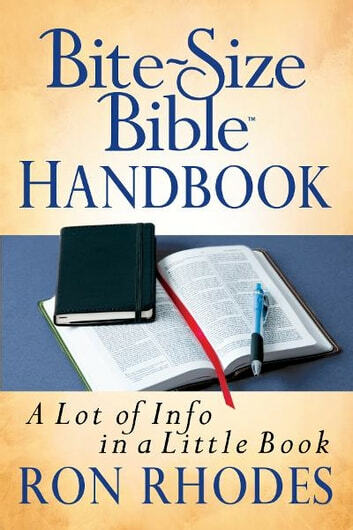 In Bite-Size Bible Handbook Rhodes uses his understanding of what readers want and need to know alongside up-to-date research to present a meaningful, insightful tour from Genesis to Revelation. Includes: easy to absorb summary paragraphs; outlines with concise details and descriptions; insight into Scripture's historical context; and wisdom for today. This little book of big truths is sized right to provide a quick reference for personal study or an introduction to God's Word and its life-changing promises and truths to a new believer. Dr. Richard B. Peoples Sr.